Las Vegas, Lees Ferry, Colorado River, Grand Canyon, and more! Marvel at the breathtaking grandeur and vistas of the Grand Canyon, ride thrilling whitewater roller coasters, hike remote canyons to cascading waterfalls, and take time for self-reflection in profound quiet, while the Colorado River whispers you to sleep each night. Our rafting trip carries us down the entire 280 miles of the Colorado River in Grand Canyon National Park, through a hundred whitewater rapids, with a motor to keep us moving so we can relax and enjoy the changing spectacle above us. By day, when we're not river running we'll explore hidden side canyons, hiking among rock sculptures of every color — black, red, blue, and white — and enjoying numerous waterfalls and swimming holes. In the evening, socialize over a tasty dinner as you get to know your new friends in our small group — just 14 of us, plus two guides. By night, sleep under a canopy of stars, as the river continues its journey of the ages. • Plunge through whitewater rapids with such colorful names as Soap Creek and Lava Falls, on a 14-person motorized raft. No paddling necessary! 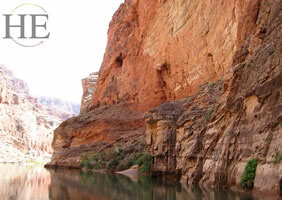 • Enjoy gourmet meals provided by one of the Canyon's top outfitters. 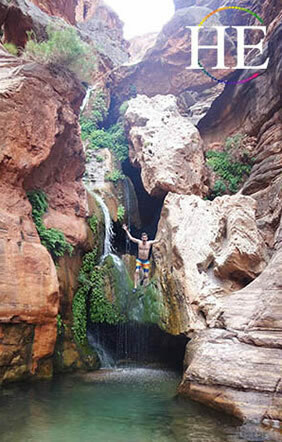 • Cool off in cascading waterfalls. • Hike to the extraordinarily beautiful ruins at Nankoweap. 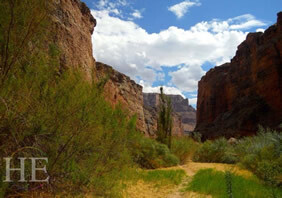 • Find yourself by hiking up towering side canyons rarely seen by most visitors to the Park. For our week of white-water rafting in the Grand Canyon, we use an outfitter with a long history of safe trips down the Colorado River. The description below recounts one particular recent Splash! trip. This departure was designated specifically as a gay men's trip; except for that, the description below is a good, general description of what you can expect. Some specific stops, hiking routes, and other details may change, based on weather, time of year, and other conditions. Our week begins in Las Vegas,a short distance for crows, but a long way, culturally and aesthetically, from the Grand Canyon. It's still a good launching point: Flights to Las Vegas are frequent, and generally inexpensive, from most North American cities. At 6:00 p.m. our group meets for a reception with hors d'oeuvres, and an opportunity to get the know the others with whom we'll be spending the week. There are 14 on our raft, plus two guides. We have ten states represented among us. There are two couples; everyone else came by themselves. Our reception is followed by an orientation by the outfitter, with time to review common questions about what to expect and what to bring along. Everyone gets a waterproof bag for clothing and similar items, plus a small waterproof box for items such as cameras. It doesn't seem like a lot of space, but the rafting outfitters emphasize how little you actually need, in the bottom of the Grand Canyon. Sure enough, at the end of the week, a frequent comment in our group is that "I never touched half the stuff in the bottom of my bag." A few in our group have the energy for a Las Vegas show. Most of us pack, set the alarms early, and head for bed. An early-morning bus is waiting to take us to Lees Ferry, the last spot with easy road access to the Grand Canyon. On the way we pick up our sleeping bags and pads, already packed in their own watertight bags, and our two guides join the group. Our senior guide is Cleve, a river runner for half his still-young life. Even now, embarking on his 102nd trip, Cleve's love of the Colorado River, of the Grand Canyon, of white water, and of people, quickly becomes evident. Assisting Cleve, in a position colloquially known as Swamper, is Jason, a college student and occasional rodeo rider. "How will the guides feel about being with a bunch of gay people?" is a common concern for members of our group, who conjure up the worst stereotypes of the Old West. It's soon clear that we have no worries in this department. 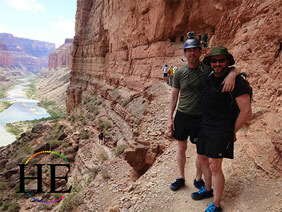 Both guides are comfortable with themselves, and with us, and gay issues promptly become a non-issue. Well before lunch, we've reached the Colorado River, boarded the raft, luggage and bedrolls are strapped down, and we get underway. Immediately we're greeted by one of the canyon's denizens, a Great Blue Heron returning to the nest after a fishing expedition. The first major whitewater comes at mile 8: Badger Creek Rapids. Well in advance, Cleve introduces us to the "Rapid Positions" we should take whenever we reach whitewater. Those in front sit in three rows of three, facing forward, tucked between one another's legs. The front riders will get the most excitement, the greatest bouncing, and the heaviest spray. In the whitest of the white water, they'll need to hold tight to the straps. The center section of the raft, known as the Tea Room (they named this spot before we arrived, honest!) offers a somewhat smoother and drier ride — but only somewhat. As we splash through Badger Creek Rapids, even those in the center feel as if they're on a bucking bronco. 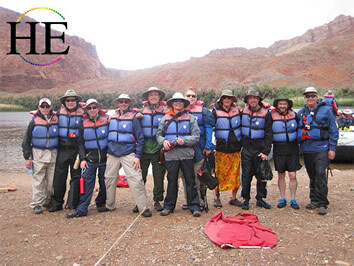 Cleve is not only experienced at white-water rafting, but also knowledgeable about the Colorado River's geology and history. He points out a layer of coconino sandstone, one of some 20 distinct and different rock layers exposed along the walls of the Grand Canyon, and one of the most important. Harder than many of the shales and conglomerates that form other layers, and that leave a slope where the river cuts through them, the Coconino Sandstone erodes away into vertical cliffs. It also protects the layers below it from erosion, creating steep canyon walls. Without it, the Grand Canyon would lose much of its drama. In the afternoon, we pull onto a sandy beach and set up camp for the night. There's no shortage of spots on which to spread your sleeping bag: Select a riverfront site to be cooler; or a sandy patch back in the rocks, for more privacy. A hot breakfast of scrambled eggs, bacon, fresh pineapple and melon, and coffee — and we're off. Within 2 miles, we've entered the section of the Colorado River known as the Roaring Twenties, with rapids at the 21, 22, 23, 24, 25, 26, and 27-mile points. None of the waves or drops are especially big, but cumulatively, they offer a good wake-up run. Pottery shards 700 years old still show up here, and Cleve's sharp eyes identify one. We each examine it, awed by its survival abilities, then Cleve returns it to the spot where it was found. This is a National Park, nothing may be removed, and next week's rafters will be equally intrigued by this remnant of the past. We'll see more evidence of the Anasazi as we continue our journey. We wash up in the river, then enjoy another tasty dinner. Cleve's talents extend even to the camp kitchen. On the menu tonight is halibut steak with herbed sour cream sauce, black beans and rice, and slaw. And for dessert, a birthday cake, freshly baked in the dutch oven. Today's breakfast:Blueberry pancakes with hot syrup, sausage, fresh fruit, and coffee or tea. It continues to amaze us what can roll off the camp stove! These are the openings of an Anasazi granary. High as they seem, a 30 minute hike, zig-zagging up the cliffs, takes us to the ancient structures. The Anasazi walled off four storage chambers to protect their grain from rodents. Each chamber was filled, then sealed off until needed. Sitting on the ledge of a structure that was built centuries before the first Europeans reached America, we get a new sense of the Grand Canyon's history. Except — we're not yet officially in the Grand Canyon. Colloquially, everyone refers to the Grand Canyon as the chasm that starts at Lees Ferry. But technically, the first 61 miles are known as Marble Canyon, a name given by Powell. (The rock is actually limestone, not marble; Powell seems to have used the term marble metaphorically, to suggest the grandeur of the space.) 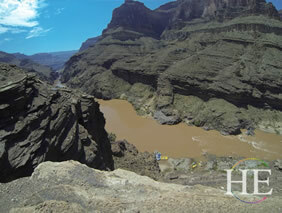 The "Grand Canyon" designation doesn't officially apply until the Little Colorado River joins in. For us, the Little Colorado is memorable for a different reason: It's a big playground where water of surreal blue tint has carved natural slides between the white boulders. Cleve and Jason show us how to reposition the lifejackets around our waists, and for nearly two hours, we whoosh down the river, singly, then in chains. Elsewhere in the world, white-water rivers are rated on a scale of 1 to 6. A 1 is easiest, 5 the most difficult; and 6 impossible if you want to come out alive. Here in the Grand Canyon, the rating system goes from 1 to 10, to allow more precision in describing the hundred-some rapids. Ratings remain only an approximate guide, however — water levels and raft size affect the difficulty of a particular run. In general, whitewater in the Grand Canyon gets about twice the rating it would elsewhere. 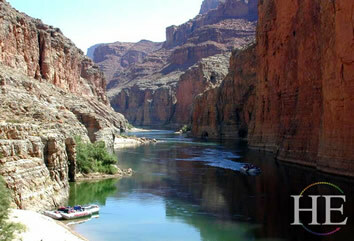 A Grand Canyon 8 is comparable to a 4 on other rivers. Unkar Rapid is rated 4 to 7, depending on conditions. For Cleve, navigating through the crashing waves, it requires full attention. For us, it's a wild roller coaster ride. "Rapids Position" is the call of the day, as we hit several stretches of white water in quick succession. Hance Rapids, rated 8 to 9, with a 30-foot drop from start to finish, is the biggest we've seen yet. We snap up, then abruptly find ourselves looking right down into a foaming hole of whitewater. The raft twists and buckles, and the Tea Room crowd is still going up, as those in front begin the trip back down. The rapids briefly thin out, and we can enjoy the scenery of the rust-colored cliffs towering above us. But we're still wet from Hance when we hit Sockdolager Rapid, rated a 7, with a drop of 17 feet. Then Grapevine Rapids, 83-mile Rapids, Zoroaster Rapids — and we're still only 10 miles from last night's camp. The river offers a surprise bounty today. All the rafters and boaters and kayakers keep their drinks cold by dangling a net bag in the water. Somebody ahead seems to have sprung a leak, and as we drift through a flatwater section, we retrieve 3 full Heineken cans and one Coke from the river. Everyone in the Grand Canyon takes seriously their responsibility to leave this magical spot as clean as they found it, so even a single can floating in the river is an unusual sight. Happily, this accidental spillage is the closest we've seen to trash. Tonight we camp in Granite Canyon. Each campsite has been picturesque, but Granite Canyon tops them all. The "kitchen" — 2 long tables and a gas-powered stove — goes at the top of the sandy beach where the raft is tied. Pink granite, flecked with black and grey, creates a terrace overlooking the river, on which we enjoy margaritas before a dinner of fajitas with fresh homemade salsas and guacamole. It's been a hot day. Several of us cool down with a skinny-dip, as the light of a crescent moon dances on the water, before falling asleep. Today we'll spend less time in the raft, as 4 hikes, each dramatically different, lure us from the river. We splash through the Dubendorff Rapids, then hike up a side canyon to another waterfall at Stone Creek. For our last stop of the day, we get a choice. The raft ties in near the bottom of Deer Creek Falls, a pounding column of water over 100 feet high. Those who've had enough hiking can stay here in the shade and mist. The rest of us hike and scramble up a 200-foot cliff. Here, Stone Creek has carved a narrow, deep, and winding chasm into the largest rocks. A foot trail takes us to a small waterfall, shaded by a lone cottonwood. This hike isn't for everyone: you need to watch your step where the hiking trail cuts close to the canyon edge. But those who hike up here consider it one of the week's most idyllic spots. Tonight's campsite is only a few miles further downstream. Soon we're enjoying stir-fried shrimp and vegetables, carrot cake, and an after-dinner coffee with a dash of Tuaca liqueur. After a breakfast of French toast, sausage, and fruit, we're back on the river. Two major stretches of whitewater await us, and two more scenic hikes. Upset Rapids provides the day's first excitement. Emery C. Kolb, one of the canyon's early river runners, capsized here in 1923, giving this whitewater its name. Kolb survived. Not so lucky was a rafting guide, on a raft similar to ours, who drowned in the 1970s when his raft flipped and he was caught in the rocks. Cleve earns our confidence, as he navigates through the churning water, but Upset Rapids offer a vivid reminder that nature cannot be controlled as easily as a ride at Disneyland. We've already spotted bighorn sheep several times during the week. Today, we'll see them three times, generally in small families of 2 or 3, coming down to the water for a drink. 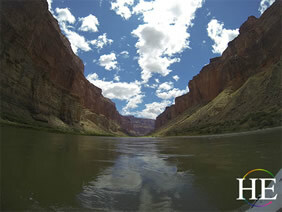 The day climaxes with Lava Falls Rapids, the Grand Canyon's roughest, biggest whitewater. It's also known as Vulcan Rapids. Many millenia ago, a volcano deposited lava into the canyon, which temporarily dammed the river, and still impedes the water's flow. Lava Falls is the white-water that river runners talk about most. It's a tricky one for the guides: Immediately upon getting through the churning water, they've got to dodge a giant boulder. Cleve and Jason, of course, handle it with aplomb, and soon we've reached our campsite. Let's not forget that this is a gay group. Soon after we reach camp, five pieces of sunbleached driftwood have been converted into a coffee table, the better to enjoy before-dinner hors d'oeuvres and drinks. It's our last full day on the river. Yet even after a week and 200 miles, the Grand Canyon still offers new sights. 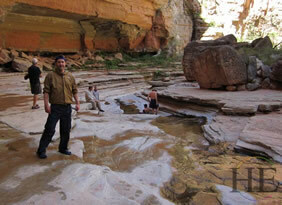 Lunch today is at Pumpkin Springs, the only warm-water spring in the canyon. A giant bowl of geothermally-warmed water spills into the Colorado River below, creating a rock known as "Travertine" with the deposits of dissolved stone that it leaves behind. We all realize, with a touch of melancholy, that this is our last dinner, and our last night, on the river. 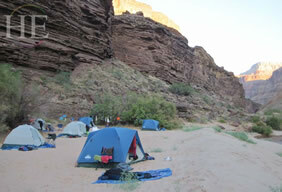 On a sandy stretch by the river, we reminisce about the week as Cleve and Jason set up the kitchen. Tonight's dinner is grilled steak. As always, there's a provision for vegetarians, but this week's vegetarians have suddenly become flexible about their diets. Just as the starting point of the Grand Canyon can be identified at two places, there's also room for ambiguity about where it ends. Some 278 miles from Lees Ferry, the Colorado River broadens into Lake Mead, a national recreation area. But Hoover Dam, at the end of Lake Mead, has raised water levels in the lake, so that the currents of the Colorado River end about 40 miles earlier. Although the canyon walls remain, there are no more rapids after this; we're officially on Lake Mead. At a spot known as Separation Point (because part of Powell's original expedition separated from the group here), we climb into a speedboat and whisk down the lake to Pearce Ferry, where a bus returns us to Las Vegas. En route, one important stop: An ice cream stand. Las Vegas does, indeed, create a sense of culture shock after a week in the Grand Canyon, but not all of the change is unwelcome. As much as we all enjoyed sleeping under a canopy of stars, nobody is complaining that they'll be in a bed tonight. This evening we enjoy Happy Hour with appetizers at a nearby restaurant/bar, leaving time to catch one of Las Vegas' many great shows; others try their luck at a casino; and still others opt for a quiet evening with their partner, or new friends. Going home is bittersweet when it comes time to leave new friends, but one thing we've learned is that the shared activities of a trip such as this will create lasting friendships. Many of us will see one another again. • Belknap's Waterproof Grand Canyon River Guide book. This tour starts and ends in Las Vegas, Nevada. Please plan to arrive in time to join the group for the 6pm orientation. No rowing, paddling or other special skills are required for this trip, and we can accommodate most physical limitations. Guests will be hopping on and off of a large raft from the shore or water level, and a helping hand is always available. The raft stops several times every day for lunch and hiking opportunities…these range from easy walks over gravel and sand to challenging climbs with steep drops. Most participants will enjoy going on these hikes, which range from 10 minutes to an hour or two in length. But you can always stay by the raft and relax if you prefer. As for bathroom breaks: We're always close to the shore, and the guides are happy to pull over if you need an extra break in between regular stops. You don't need to pay the single supplement if you're traveling alone. We'll be happy to match you with a roommate. Pay the single supplement only if you want a bedroom to yourself in Las Vegas. Will I get tired of being on the raft all the time? You won't be in it all the time. A typical day will include just four or five hours of rafting. There will be sections of flat-water during which you can relax and enjoy the scenery, as well as over a hundred whitewater rapids. The rest of the time we'll be exploring the side canyons that are rarely seen by most visitors, hiking, swimming, or fishing. I don't know how to swim. Is that a problem? No. You don't need to swim unless you want to, and everyone will be wearing a life preserver while on the boat. Lots of non-swimmers take this trip. Will our captain and crew also be gay? Like any other "driver", such as an airline pilot, boat captain or bus driver, our raft guides are selected for their dedication to the safety and enjoyment of their passengers. In the case of the Grand Canyon, their ability to plan and cook nutritious and interesting meals outdoors for a week is important as well. Based on these criteria, we ask for the most qualified guide available, whether or not they are gay. The swamper is an assistant who works closely with the senior guide, and the tradition in the Canyon is that the guide selects his or her own swamper. After all, they must live intimately together for a week at a time, and work closely as a team in both guiding the raft and preparing the campsite and meals. The swamper may be a guide in training, a good friend of the guide, a spouse or boyfriend/girlfriend. In every case, we have always found both the guide and swamper to be welcoming of our gay groups and a joy to travel with. You may find rainbow and brown trout when the River is running clear. You must purchase a fishing license in advance, and we are happy to send you more information upon request. We suggest bringing a small folding rod, for easy storage. You must bring your own fishing supplies, or get them in Las Vegas; there is no opportunity to pick up supplies after that point. Will I be able to communicate with the outside world, or leave mid-trip? Emergency Communications – the river guide carries a satellite phone to make medical calls out. If there were a true medical emergency, Life Flight would be called and a basket dropped down to the raft. However, the guide's phone is not available for client use. You could rent a satellite phone if you had an urgent need to be in touch with someone back home, but it would be very expensive, and would certainly detract from the joy of being so remote. Getting out of the Canyon before Lake Mead – there are two ways to get out of the canyon during the rafting, both at about the half-way point. At Phantom Ranch the trail winds down from the South Rim, crosses the river, and goes on to the Ranch. It is about a full day hike from the bridge up to the South Rim, and certainly not recommended, since you will be equipped for rafting, rather than for a long hike. The other way isn't really practical either – there is a helicopter pad downstream from Phantom Ranch, but you would have to arrange your own helicopter in and out, and it is mighty expensive. And of course the problem with both of these options is that it will take 3.5 days to get there after we start rafting, and once you pass each point, that option is gone. Therefore, there is no practical way to leave the trip mid-stream. If you have an urgent matter back home that might require your signature, you might want to talk with a professional about the use of a Limited Power of Attorney, to grant someone the power to execute documents for you while you are gone, in accordance with your instructions. Must I make a strenuous hike to get out of the canyon at the end? 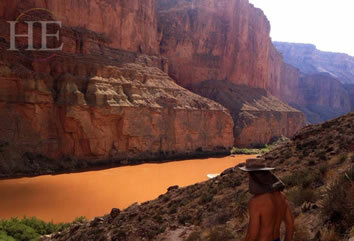 Some river outfitters just raft half the Grand Canyon. If you start or end the trip halfway down, there's no way out of the canyon except with a long hike. We raft all the way from Lee's Ferry, Arizona to Lake Mead, with easy access at each end. It's virtually unknown for rafters to experience seasickness. The rapids are exciting but short, and the up-and-down motion of the raft is too brief to bother most people. Most of our trip is spent on calm water, where you can relax and enjoy the ever-changing scenery. 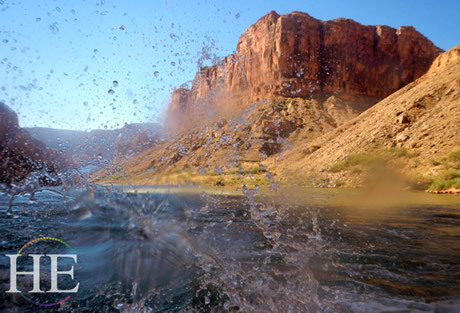 Thousands of people have safely rafted down the Colorado River, but a trip of this nature inevitably involves some risks. Emergency evacuations are possible, and we provide insurance to help cover the cost if such an occasion arises, but we recommend you check your own insurance policies as well, as ultimately costs of such aid are your responsibility. Is one time of year better than another, in terms of water levels? No, the water is controlled by the Glen Canyon dam, upstream, so the rapids stay about the same year around. Water levels fluctuate 6-12" some daily, you may not even notice until it is pointed out to you. What temperatures should I expect in the Grand Canyon? While the numbers are high, the dry air, combined with opportunities for swimming or hopping under a waterfall, will help keep you comfortable. The water is cold (55 degrees) at Lees Ferry, at the start of the canyon, because it's being released from the bottom of Lake Powell, behind the Glen Canyon Dam. It gets only slightly warmer as you travel down the canyon. Not much! We supply all the camping and sleeping equipment; waterproof river bags; portable toilets (always set in a private part of the campground, and probably featuring the best view of any bathroom, ever); and all meals. We'll send you a suggested packing list a month or two before the trip. Don't worry about investing in a fancy duffle bag, as the only luggage permitted on board is the waterproof gear provided by the outfitter. You can also leave a suitcase at the hotel with any items you want with you in Las Vegas, but will not need in the Grand Canyon. The first and last nights are spent at a hotel in Las Vegas. On the river, we'll camp outside; everything you'll need is supplied. Tents are available, but except for the rare evenings when it rains most people prefer to sleep under the stars, enjoying the distant twinkle of the Milky Way as they fall asleep. Sleeping on the ground becomes so insignificant in terms of the rest of the grandeur and adventure and camaraderie that the trip offers. For the first night in camp you get a bed-roll that becomes yours for the week. Included is a very nice sleeping bag, a blue tarpaulin for ground cover and a self-inflatable air pad, which is about an inch and a half thick. All the campsites are on beaches, so you are generally sleeping on sand. Of course sleeping on the ground can never be as comfortable as sleeping on a bed. But the UPSIDE is that sleeping alongside a rapid provides some of the most soothing ambient noise that and best relaxation that you will ever find and the view of the stars is magnificent! What are the meals like? Can you provide for special dietary needs? You'll be amazed what our guides can prepare over the campfire! A typical dinner will include a meat course, fresh vegetables, salad, biscuits, soup, and dessert. Moreover, unlike most companies, we supply beer and wine with dinners, as well as fruit juice, soft drinks, and water throughout the day. (We carry several hundred pounds of ice along, just to keep everything cold!) The sublime beauty of the Grand Canyon, and friendships you form on the voyage, will undoubtedly be your best memories of this trip. But the superb food is likely to be a close second. Many special dietary needs can be accommodated, and our pre-trip questionnaire will ask you about any such needs. If you have unusual requirements, we'll be happy to supply storage space for food that you bring along. Am I expected to tip the guides and host? Crew If they provide good service, then yes, a gratuity at the end of the trip is customary and appreciated. We're confident that you'll be so impressed by the helpfulness, knowledge, and culinary skills of the guides, that you'll be eager to show your appreciation. We suggest a 5-10% tip at the end of the trip, which will be divided between the captain and swamper. Because there are no ATMs on the river, you should bring cash for tipping the crew on board with you. HE Travel Tour Director Tipping your HE Travel tour director is at your discretion. Rest assured that he or she works hard behind the scenes to ensure that your vacation is a wonderful, adventurous, once-in-a-lifetime experience. Your HE Travel host is there to deal with any snags or hiccups so that you can enjoy your well earned holiday. We suggest $10-12 per day depending on the level of service you receive. Do I have time for a Las Vegas show on our first evening? CrewOur first evening is fully scheduled, with a welcome reception and meal, and orientation. Guests then adjourn to their rooms to pack their things into the waterproof bags provided. The next morning is a 4:20am departure. If you want to enjoy a show or the other delights Las Vegas offers, we recommend additional nights in Las Vegas. We are happy to help you arrange hotels for the duration of your stay. Can I fly out the night we return to Las Vegas? CrewWe usually arrive back to our hotel by 4:30 or 5:00pm; construction or other delays can affect that. All of our guests really value a hot shower upon arrival, and many like to do a load of laundry rather than packing their suitcases full of dirty camp clothes. We walk to dinner together tonight and our hotel for this evening is included. You will find yourself more comfortable if you book your flights the next day (shown as the final date of the tour).